Someone on the Handi Quilter Sweet Sixteen Yahoo! Group (HQ_Sit_down_model) asked about thread recommendations. Here’s my response in case it helps anyone else. Superior King Tut – Can get a bit linty/fluffy, especially if you’re going fast. Rarely breaks. Superior Rainbows – Shreds/breaks occasionally; no fluff. 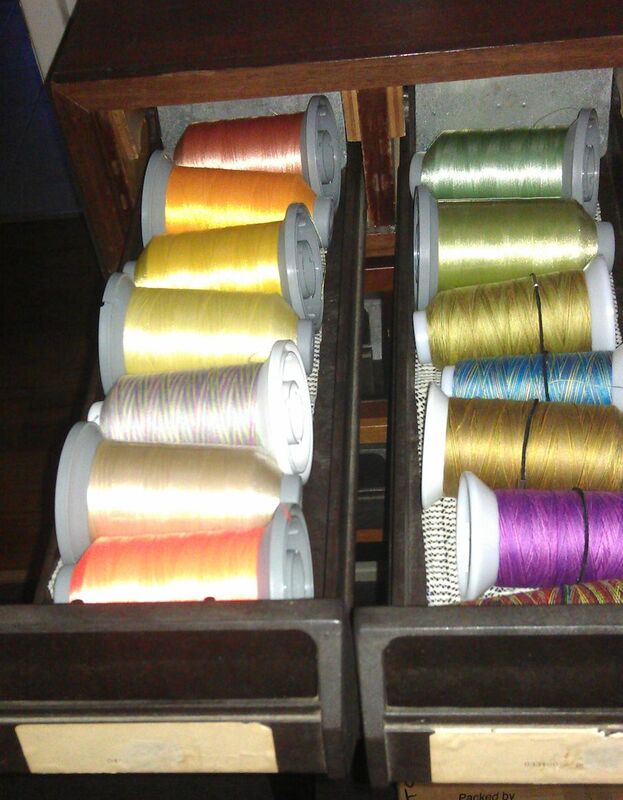 Isacord 40 wt polyester – I LOVE this thread in my S16 – it goes through the machine like a hot knife through butter. Never breaks or shreds and no fluff and looks good on the quilt. Big colour range too. Fil-Tec Harmony – similar to King Tut as it’s also a cotton; can be very fluffy/linty especially when you’re going fast so clean out the bobbin area and the tension disks often. Madeira Rayon – shreds/breaks occasionally; I only ever thread this through no more than two top holes (sometimes only one) otherwise it breaks more often. No fluff. Floriani (embroidery thread?) – as for Madeira Rayon; not sure if this is a rayon or polyester – it’s definitely not cotton. For bobbin thread, I tend to use lightweight threads, such as Wonderfil’s Deco-Bob (80 wt) or Invisifil (100 wt), or Bobbinfil (70 wt). Update: ALso Fil-Tec Magna Glide Classic pre-wound bobbins (60 wt) — love those!! I have used normal 40 wt thread in the bobbin, but I hate having to change bobbins so often with that 😉 On one lap quilt, I used King Tut in the bobbin and the top – I had more than 10 bobbin changes (I think it was about 12) for that quilt, whereas when I use Deco-Bob or Bobbinfil, I can often get a lap quilt done with just two bobbin changes. And with Invisifil, even fewer (though I think Invisifil is a little thin for a quilt that’s going to be used a lot – it’s good for art quilts, though). Remember, this is MY experience with MY machine. Your experience with these threads differ. Always test on a scrap sandwich and adjust tension and needle size if you can’t seem to work with the thread. Wonderful post. I have a project for g.grand daughter that I have been using Coats/Clark rayon decorative thread. it is high gloss and so lovely in the quilting. Will post one of the projects tomorrow. New ‘puter is wonderful!!! Hugs…. I have a sweet sixteen and I am having terrible problems with the thread tension. I can get it going ok when I have the same thread in the bobbin as on the top, but if I want a light weight bobbin thread, like bottom line, with a heavier thread on the top, the tension goes completely to pot and and I just can’t get it right. Often I don’t want a heavy thread on the underside of the quilt – this is driving me crazy. Can you help with any suggestions? First, watch Jamie Wallen’s EXCELLENT video on thread tension. While he’s referring to a long-arm, almost everything applies to the Sweet Sixteen as well. Handi Quilter also have a good video on thread tension. Then read my post about issues related to thread tension. Thank you so much for such a prompt reply! I will do as you say and see how I get on. I live in the Middle East and it is very difficult to get any kind of help here – my requests to handiquilter have been unanswered, so again, your reply is much appreciated! Just thought I would let you know that I have done all that you suggested re the videos, cleaning, etcetera, and for the first time since buying this machine, I think my tensions are ok. Have tried with bottom line in the bobbin, with a 30wt on the top, and it’s looking good. For the first time I am not regretting buying this machine. My problem has been that the top has always been too tight, and I wasn’t cleaning the bobbin area well either. Thanks for your help – it’s greatly appreciated! If the Isacord thread you use embroidery thread? I can’t seem to find anything else mentioned online. Yes, it’s their machine embroidery thread. Rhonda, what a great post. I have a sweet 16 and I adore it ! It is so great to be able to share info about this machine since I don’t have a person I can go to when I need help. I am going to try the Isacord thread and the bobbins you recommended. Thanks again for sharing….you go girl ! I LOVE my Magna Glide Classic pre-wounds (from Fil-Tec), and never have to adjust bobbin tension after replacing one mid-way through a quilt. I rarely have to adjust top tension either, unless of course, I change the type of top thread. A million thanks for your article, my sweet sixteen nearly had me in tears every time I needed to use it, could never get the tension right (either of them)until one day I put in Magnifico thread top and bottom, instead of a cotton thread, it was like magic, lovely stitches top and bottom, but you have given me so many more options to try, and many good articles to read also. bless you for your generosity in sharing info.